When I arrived at the home, the sellers were sitting at the kitchen table and the wife was in tears. “Our house is breaking in two!” “My husband has been laid off and the contractors are telling us it’s going to cost more than $10,000.00 to repair our cracked foundation.” I asked if I could see the floor crack. The husband took me into the living room and showed me. It was about 3/8-1/2-inch wide and extended across the entire width of the room, from the back wall toward the front. He explained, “we pulled up the carpet to put down hardwood flooring and we found this.” “It’s pretty bad, isn’t it”, he exclaimed. I peered around the room in a 360-degree glance and did not see any drywall cracks in the walls or ceiling. I walked across the floor and did not detect any floor slope. Finally I explained, “Mr. Smith, you have nothing to worry about!” This is simply a shrinkage crack. It is not a structural crack or sign that your foundation is breaking apart. It’s purely cosmetic. To understand the mechanics of this crack development, you’ve got to understand that readi-mix concrete that is hauled to construction sites in those big trucks with the turning drums consists of a mixture of sand, cement, gravel and water. This plastic mix is turned out of the drum onto the ground or into wheelbarrows and spread about the foundation, and then it suddenly starts to harden and eventually turn to the rock like substance we call concrete. This happens because of the cement content in the mix. The cement and water chemically react to cause the plastic mix to harden. All of the water that was in the concrete mix disappears in about six months time. Most of this water disappears in the first few days following placement. The water either percolates down into the ground or evaporates up into the air. This leaves behind ¾ of the original constituents: sand, cement and gravel. Because of the loss of water, the concrete undergoes a volume reduction or “shrinkage”. Since the concrete was poured out in thin layer over the footprint of the house, most of the dimension change that takes place occurs over the footprint. As the concrete tries to shrink, frictional forces at the bottom of the slab (from contact with the underlying subgrade) try to prevent the concrete from shrinking or contracting. This sets-up tensile stress in the concrete. Concrete is very strong in compression but very weak in tension. In other words, it’s easy to pull-apart plain concrete. Hence, when the tensile stresses get large enough the concrete separates and cracks open in the areas of highest stress and this is usually out in the middle of the slab. All houses with concrete floor slab foundations have these cracks. It is impossible to prevent them. 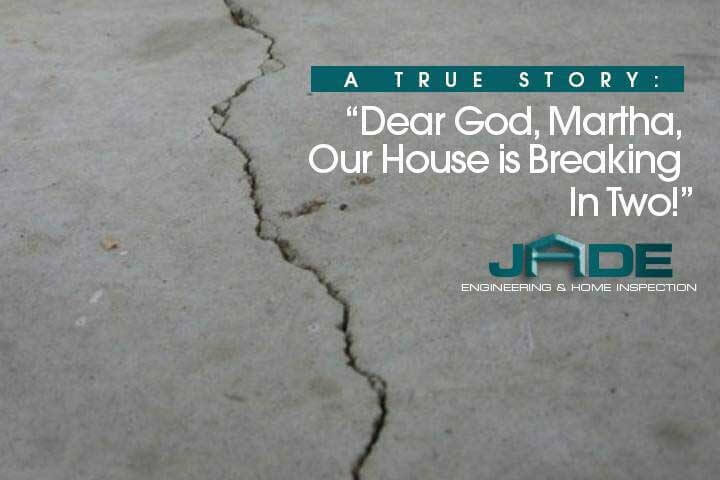 That’s why we at JADE Engineering always recommend that contractors place wire reinforcement mesh in the concrete slabs, so if and when it cracks, the wire keeps the cracks closed. If there is no wire in the concrete, then the cracks open in proportion to the loss of water in the concrete. If the contractor adds large amounts of water to the concrete mix when it’s delivered to the job site, he is increasing the amount of shrinkage that will occur. Hence, it’s not unusual for shrinkage cracks to be ¼ to ½ inch wide or even wider. So, if you ever pull up carpet and see a big ole crack in your floor slab, take a deep breath and relax. Because the crack is probably nothing to worry about, especially if there are no surrounding interior drywall cracks.